Explore hardwood forests, open meadows and wetlands teeming with wildlife. Experience outdoor cookouts, lasting friendships and campfire fun. Meet live animals, play fun games, learn new skills. Select from a wide variety of themed weeks including: Survival Camp - Spy Camp - Art in Nature Camp - Leadership Adventure Camp - Mud Madness Camp - and more! The Kortright Centre is named after author and conservationist Francis H. Kortright, an early proponent of environmental awareness, stewardship, and sustainability. Those are some very big, important ideas, and since it opened in 1982, the centre has dedicated itself to addressing them. Administration has also dedicated itself to bringing those concepts to a wider audience, and doing it in creative, age-appropriate ways. The summer programs are perhaps the prime example of that—they are based in all the big ideas, but kids see them more as fun than learning, which is exactly as it should be. Mud Madness sessions, for example, don’t announce themselves unduly as educative, and the same is true of the spy camp session. Nevertheless, in those as in all the others, kids come away having had a lasting, memorable, and fun engagement with the natural world, having also built an appreciation of nature and our place within it. It’s impressive, to be sure, and there is nothing quite like the Kortright Centre. Of less importance to kids is the infrastructure and the architecture, which is delightful in a way all its own. Staff are truly experts, engaged in their own ongoing work at the centre, including offering exceptional instruction and mentorship. It’s time to look up … way up and see the fabulous and fascinating kites. A great family outing where you can see professional kite flying demonstrations, make a kite, enjoy pond dipping, have a picnic and more! Come to the Kortright Centre for Conservation on your PA Day and explore the world of Forest School. Students will enjoy the benefits of a day spent outdoors where nature becomes the classroom. Learn fascinating information about bats through an engaging theatre presentation and a guided walk with a bat expert through bat habitat. Learn how to build bat habitat structures and about the challenges these animals face. Children interact with the natural environment through the use of loose parts, creative play, shelter building, whittling wood, cooking on an open fire, knots, making woodland crafts, and sharing stories. This child-led approach to learning is exploratory, inquiry based, fun and unhurried. Sessions are 3 hours in length. Studies show the many benefits to children spending time outdoors. Take your tot to Kortright to meet other parents and children. Participate in story time, a nature craft and guided age appropriate outdoor activities. Advance registration required: 416-667-6295 Sessions are 1.5 hours in duration and are recommended for children ages 1-5 years accompanied by a parent for the duration of the program. Enjoy music and entertainment, tour the Bee Space, meet a beekeeper, taste honey, make crafts, build a bee habitat, see some live animals, and much more! Come out and visit Kortright as part of the Culture Days 2019 Event. Admission is FREE. Join Kortright staff by our picnic shelter to see what we have to offer all year round. Enjoy a campfire (bring your own items to roast), dissect an owl pellet, discover interesting creatures, talk to a naturalist and find other family friendly crafts and activities. Take a self-guided walk in our beautiful mixed hardwood forests to view the fall colours at their best. Join the Kortright Education team at the campfire to learn about nature in the fall. Family friendly activities each day, plus bring something to roast over the fire, grill and roasting sticks provided. Celebrate the Halloween spirit with spooky and scary activities at Kortright. Discover a haunted house, a frightening forest walk, Halloween activities, bonfire, scary stories and live owls. Fun for children 10 and under. Children must be accompanied by an adult. Come and experience an evening with live owls! Start the night with a presentation in our theatre ,then head out to the forest for a guided walk with one of our owl experts through owl habitat and call to Kortright’s wild owls. Enjoy and learn about the night sky through an engaging presentation delivered by an astronomer. Learn about history, mythology and how to identify star constellations overhead. This is a family friendly event. Advance tickets required. Come to Kortright and experience a winter wonderland filled with crafts, activities and treats for the entire family. Go on a horse drawn wagon ride and see Santa's workshop and Santa Claus himself. Children 1 year of age and younger free of charge. Advance tickets required. 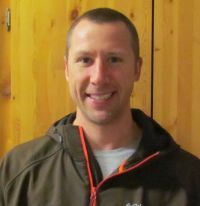 I've been involved in children's outdoor education for over 20 years. Most recently I've been overseeing the education programs at the Kortright Centre including our nature day camp. Over the years it's been an amazing experience to watch children grow and develop as they interact with the natural world. As a parent, I know that my children do not have the same opportunity to freely explore the natural world that I did as a child. At Nature Day Camp we bring kids back to nature! Spending time in nature is invaluable for childhood development. At Kortright we let children go wild! They connect with their wilder side in a fun and safe environment. We have ponds, rivers, wetlands, meadows and forests just waiting to be explored. 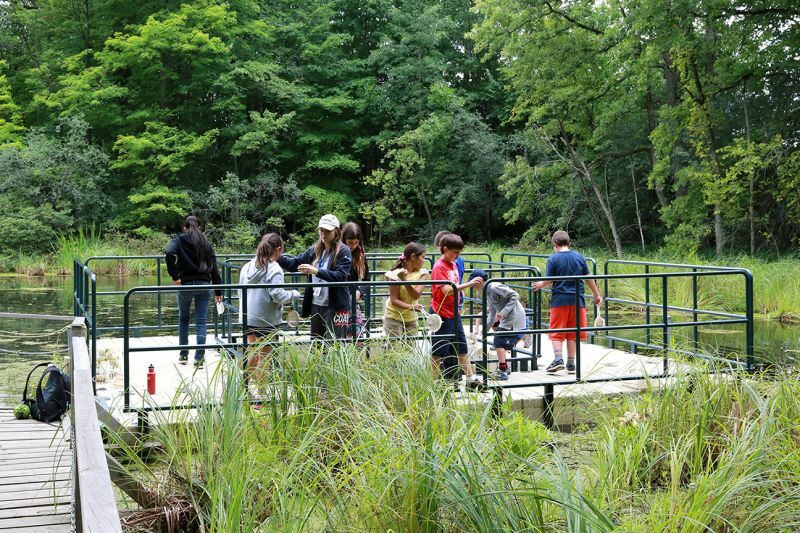 Campers have the opportunity to look for for bugs under rotting logs, catch frogs in the pond, see families of deer wander by and watch as caterpillars turn into butterflies. Live animal shows, interactive games, crafts and hikes are just a few of the activites that our campers enjoy. Depending on the week campers may dig for ancient artifacts, build a shelter, explore our low ropes course, make their own instruments, or silently track animals through the forest. On our hottest days, campers make a splash with water games and activites. Each week our campers have the chance to cook over an open fire and camp out under the stars. All of these activties are supervised by our team of experienced outdoor educators. There's something very special about Kortright Kids. They all seem to share a love for adventure, and it was because of this love that I put my campers in new, exciting, and sometimes ridiculous situations this summer...situations they tackled with unbridled enthusiasm, and then asked for more! Like the time I let my campers lead our hike, and we trekked all the way to Earth Rangers just in time to 'spy' on their staff (Spy Week). It was a hot day, and there were no complaints - just giggles, songs, and cheers...we got back to the Kortright property and they asked to go out and spy again! Or there was the time during Art and Music week when we ventured out to find the most peaceful spot where we could to pause and make our own music. We made a bunch of different, beautiful melodies (including some beatboxing a camper started! ), and none of my campers wanted to break for lunch! They were so in tune with the sounds of nature around them, and so excited about adding and experimenting with their own unique noises. Despite how peaceful that sounds, the majority of our summer was spent taking Mrs. Frizzle's advice and taking chances, making mistakes, and getting messy! There were a couple weeks where my groups spent most of our days covered in charcoal, regardless of whether or not we had made a fire (sorry, parents!). We had failed experiments that made our successes even more exciting. We faced fears (mostly in Coyote Ally at night, but also in insects, water, and dirt) and came out stronger! My campers took charge of their camp weeks, and because of them I have so many amazing memories of rolling down hills, racing to destinations, stomping in puddles, and looking at Kortright with new wonder. Our campers are fantastic, and Kortright is the perfect place for their curious minds...I can't wait until next summer! For the past two summers my children have spent a week at Nature Day Camp at Kortright. The car ride home each day was filled with laughter and great stories of their adventures in nature, step-by-step instructions of the new crafts they had made that day, stories of fearless camp leaders and repeated renditions of whatever new camp song they had learned that day. The overnight camp-out at the end of the week was a great addition and gave the kids an authentic camping experience: tents, bonfires, marshmallows and lots of fresh air! My kids were exhausted and dirty at the end of the week, but came away with great memories and a greater love for the outdoors, which in this mom's opinion, means it was a huge success! This was my second year at the Kortright nature day camp. This year was my first year in the leadership adventure camp. Each day we did leadership and team building activities in the morning and fun nature activites in the afternoon. One of my favourite experiences at camp was going down to the river. We had nets and bins and caught a whole bunch of fish and tadpoles. I slept overnight at camp and made some new friends. We played games, had a campfire and got to eat banana boats and do some skits. It was fun! We got to sleep in a tent too. Another neat thing was going on the low ropes course and learning how to work as a team. Some of the courses were pretty hard, but we worked together and were able to do them all! One of the favourite stories of summer camp is the day we went down to the river. It was a sunny summer day and the temperature was perfect. The campers wanted to go down to the river and I thought it was an excellent idea. With water shoes on our feet, hats on our heads, water bottles and snacks in our bags and dip nets and buckets in hand on we began our hike down to the Humber River. When we got down in the valley, we heard a noise up in a tree, and when we looked up we saw a pileated woodpecker cleaning out his tree cavity. He stopped and looked at us, as we watched him. The animals must have thought it was a day to play as well. As we continued on our hike one of the campers shouted “look the squirrels are playing tag,” the rest of the group looked over and sure enough we saw two red squirrels jumping from tree to tree chasing each other. Taking the idea from the squirrels the campers asked to play a game of tag. We set down our equipment and played a game of hide and seek tag, where the some campers would hide in the forest while the camper who was it went to find them. After about five minutes of playing, it was time to sit and eat a snack. After snack we continued on out hike to the river. We heard the river before we saw it, it sounded so inviting. As a group we went into the river and filled up our buckets full of water. Now it was time to find some river creatures, as we waded in the water up to our knees, we saw something swimming. One of the campers scooped with their net and caught some baby minnows. We put them in the bucket and watched them swim for a while. While we were down at the river we caught lots of different creatures; crayfish, frogs, tadpoles, and minnows. It soon came time for lunch and we put the creatures back in the river and headed back to the centre. This is a story about 4 years of summer camp at the Kortright Centre. I love summer camp! First, every Thursday night we have a sleepover. Before bed we do a very fun night hike. Sometimes we see cool creatures. We also sleep in tents. When it was night I heard coyotes. When I had to go to the washroom we had to go through the trees and we saw a raccoon climbing a tree. On Fridays, we have a cookout lunch. We cook hotdogs on a fire. After the hotdogs we make smores...yum. Next we go pond dipping. One of the days we went there, we caught five tadpoles and one big water bug. One day we caught one big green frog. We also make lots of crafts. One time we made an Aboriginal craft and it was nature made. We also made silly putty. It was a lot fun. We even dyed shirts (tie-dye). Then we went to the beekeepers house. I got to wear the beekeepers suit and the counsellors Brianna and Hally took a picture of me. We made a frame and we put the picture in the frame. I got to taste honey samples. It was very sweet. Also, I went to the bird farm. We saw peregrine falcons. We even saw an eagle and two owls. One of the peregrine falcons was very crazy. Then we went geocaching. I got to decorate my geocache. I went into the grass and hid my geocache and used a GPS to find everyone else's geocache and mine. Finally, the games we played were: manhunt, camoflauge, orienteering, and also we did races that we got sprayed with a spray bottle. I had so much fun at the Kortright Centre! Interested in Kortright Summer Nature Day Camp?